Vietnam does not do daylight savings time so the midnight flight was moved earlier during the change so it continues to arrive in Seoul at the same time each morning. That extra hour makes this layover in Seoul before the flight to Chicago seven hours. With the benefit of free WiFi, I get to blog some more. 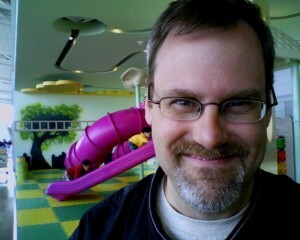 The sole AC outlet at the gate is two feet from a children’s playground, so I am sitting on bright yellow cushion 10 inches off a padded floor, a few yards from three plastic fuchsia slides. 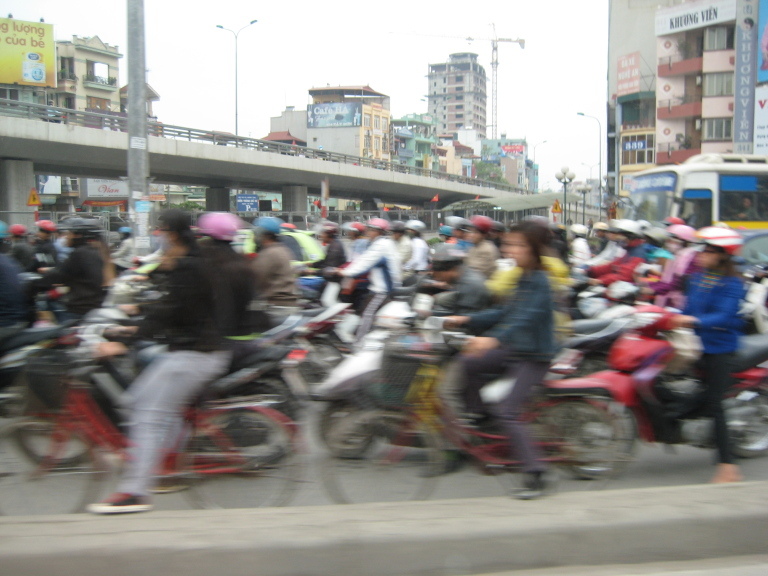 Tuesday in Hanoi we made what I would assume to be the customary stops for the city. Ho Chi Minh’s mausoleum, his museum, and the presidential palace. It seems almost every important government building in Hanoi is peach colored and was built by the French 100 years ago. We saw a 1000-year-old Confucian university and another shrine to ancient soldier and his turtle. 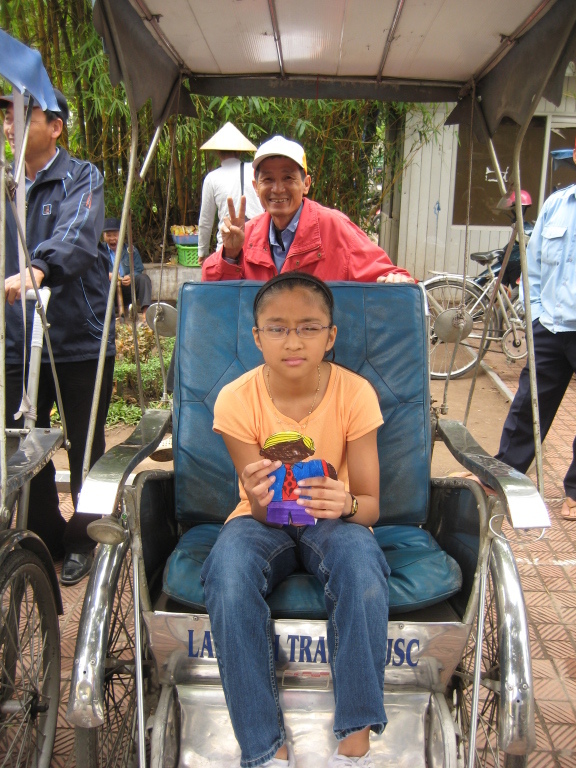 We brought Flat Stanley from Claire’s first grade class along with us for the tour of the city by cyclo (bicycle rickshaw). I wanted so badly to swap positions with the driver so I could experience cycling in the city, but I restrained myself. Traffic in the major cities is crazy with vans, cars, scooters, bicycles and pedestrians all sharing the same, very busy roads and all going different speeds. Horns are used constantly in lieu of sufficient intersection control via traffic lights. We had a very nice lunch at the restaurant where Bill and Hilliary ate when they were visiting as president and first lady. A large picture hung in the front dining area. The highlight of the day was the water puppet theater. 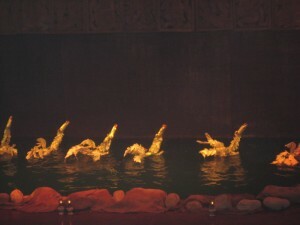 Wooden puppets about a foot tall sit balanced on long dowels that stretch just under the water’s surface. By the manipulating the dowels underneath, the puppets appear to be dancing on their watery stage to synchronized music. Very cute. We had dinner at the hotel and, like lunch, the choice of courses was chosen for us by the restaurant. In fact the meals were very similar. Marissa, thank goodness, likes steamed rice, because she liked nothing else. I was more adventuresome and ate a little bit of everything at dinner. In hindsight, I have empirical evidence that something I ate did not agree with me, but I don’t think I will elaborate. 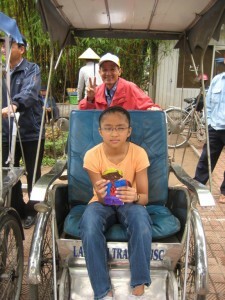 I didn’t really like Hanoi. All we did was sightseeing.